Book a skilled gutter cleaning expert in Des Moines. Backed by a total satisfaction guarantee and amazing customer support. 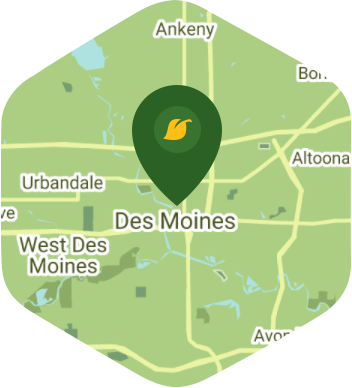 The capital city of Iowa has a certain building with a gold dome that shines brightly during the day, and it is also one of the things that most people associate with Des Moines. You call Des Moines home and are very proud to do so because it is indeed a truly beautiful city. We can only imagine how much you look forward to spending a relaxing weekend at one of the city's parks or just sitting at home chilling. However, you might not be able to do much relaxing if your gutters are a complete mess. Gutter cleaning can be a real drag and is not exactly the most fun thing to do during your free time. Well Lawn Love doesn't want you to waste away a perfectly good weekend doing gutter cleaning, so just leave that to us. We can remove all the sticks, leaves, and other debris from your gutters and make them look as good as new again. We have the manpower and the tools to keep your gutters clean all year long. We also have a mobile app and website where you can easily book your gutter cleaning service. If you want the best to clean your gutters, just give us a holler at 515-305-3166, or ask us for a free online quote.